Saturday morning, set out for Stevenage, 11 miles. This is but a small place, nothing very tempting. Very good inns, enclosures regular, fences now begin to assume the old appearance, a jungle of every kind; seldom or ever see a crow or crow’s nest. Have seen a great many sheep and cattle on their way to Smithfield market. The country here is a very plain level on both hands, and has the appearance of one continued wood. We see from gentle rises 30 miles to the west, the view to the east not so extensive. The soil here is pretty clayey, wheat and beans being the principal crop; few turnips anywhere. From Stevenage to Biggleswade, 14 miles. This is a very long, ill-built town; there is only one stage house, but many small inns; there is but one principal street. This being the fair day, there were a great many people in town; the sheep all in pens by the sides of the houses. Here the speech is more difficult to understand than anywhere I have yet been. I asked some of the dealers if there were any cattle in the market, but they did not seem to understand my question. From Biggleswade to Bugden, 16 miles. On the way here I have seen some ploughs drawn by three horses, two behind abreast and one before. Here I put up at a second kind of inn, where all the drovers lodge. Along one side of the town street there is a row of elm trees, 30 feet high, and about seven feet distant from each other; they are dressed every year the same as a beech hedge, and every way in a line tops and bottoms. The hills here are all of a chalky substance, which is laid on the ground for manure, the same as lime or marl, but much thicker. They lay sixty carts per acre. It is very easy to come by, as being in every hill around. It is said to last a long time in the ground before being exhausted, but not quick in appearing. This being Saturday evening and pay day, a great many tradesmen and labouring men came in to smoke their pipe and drink ale. I overheard from a Corner where I was sitting they were strong against the Ministry for abolishing income tax, and laying a heavier duty upon malt and ale. On this stage I have seen a great deal of wheat on dry ground. They were folding ewes and lambs upon it. They say it pays as much to be eaten by ewes and lambs as any way else. If it gets rain soon after eating they will still have a good crop. The service it does to the feeding lambs is very great. All the trees here are pollarded, willows in particular; many thousands of them on marshy low ground cut over about ten or twelve feet high. There will be 160 sprouts growing round the top. Each of them shoots from ten to fifteen feet high, they have the very appearance of a painter’s brush, and have a fine regular look. The shoots are sold for hop poles or hurdles for sheep on turnip fields. Friday, left London at three in the afternoon for Baniel, 10 miles. For several miles we saw nothing but grass fields in every direction. Upon a gentle rising ground, about five miles, we have a view of a part of London, and saw over to the south side of the river, for many miles. It appears a wood as far as your eye can carry you; the soil on most of the way is excellent. Towards the end of the stage it is but very middling. Baniel is a pretty little town, seems a perfect thoroughfare, and carriages coming into it and going out in every direction. From Barnet to Hatfield, 10 miles. The Marquis of Salisbury’s house is close by the inn; at least the gate into the house and park. This is amongst the first houses in England, and can be seen on certain days of the week, but being sunset when I got there, I could only see the outside of the house. The deer are numerous and beautiful. There being a very great public meeting of the nobility with the Marquis that day, and the servants and horses all at the inn, I had much ado to get lodgings. The landlord here has a hog 21 years old, a very wonderful animal of the kind. I never saw such another; he is not of the long kind, but the thickest and fattest at present they know of. Many hundreds of pounds are depending as to his weight. He is to be killed at Michaelmas, and to weigh 120 stones, London weight, after the grease is taken out. He is kept as clean as any galloping horse, and not disturbed at any time unless you pay sixpence to the keeper to make him get up. The soil on this stage is very variable, hedges in general very well kept in order, farming not so bad. I now seem to be past all the milk pastures, for ten or twelve miles from town nothing to be seen but milk cows. Here is seen feeding stock, both cattle and sheep, but all in very small numbers – 20 or 30 in a field. This is the dearest house I have been in since I set out; the stabling and other accommodation, without doors, are very extensive. The inn itself is very large and well furnished. England, in all its departments, is well worth seeing. I was in every one of them, the Exchange, the halls – where the meetings are held – with many other things. I was informed by a person concerned that there were about 600 people of one description or other employed in or about the Bank. I was taken through it all by a gentleman in public office. Greenwich Park and Hospital is a most delightful place, six miles down the river. The building itself is of the finest and strongest kind; fine paintings, and apartments for 2200 sailors. They are a strange group, wanting legs, arms, and other parts of their body, very much shattered; still they swear as hard as ever, and seem to envy people on board going up or down the river, which comes close to the foot of the court. The new docks on the opposite side, two miles up the river, are most extensive works; thirty acres of land taken out the depth to carry on water the best ship that sails. Warehouses and cellars are built alongside of them fit to take in all the goods that come up that length. A stone and lime wall, or bevelling breast work ten feet thick, surrounds the whole of these docks, which have cost £2,000,000 already, and will require a great sum still to complete them. As to particularising everything notable and wonderful, it was impossible for me in my short stay; though I was walking every day I was there from morn to evening. Every person behaved civilly that I spoke to, but pitiful to see the blackguard-looking creatures of both sexes, some from an early period gone into prostitution, and others that have been in that way going about miserable objects; their language is most abominable; swearing amongst the lower class is bad. Friday, attended Smithfield market; it was a much better and quicker sale than Monday, and everything sold off by one o’clock in the afternoon. St Paul’s is a wonderful piece of architecture, both for size and execution. Many large statues, paintings, &c. The height of the spire from the foundation is 403 feet; when upon the highest balcony you see some parts of most of the principal streets in town. The building covers 2 acres 16 perches of ground, with iron palisades about it 2500. On a pedestal is Queen Anne in full statue. The length of the minute hand of the clock is 8 feet, the weight of it 75 lbs; length of the hour hand 5 feet 5 inches, the weight of do. 44 lbs. On the street you would not suppose these hands half the length. The length of the figures on the dial-plate is 2 feet 2 inches. The circumference of the dial is 57 feet. The re-building of it was begun in 1675, and finished in 1715. Is 6d a sight. The Tower is also a very extraordinary thing to see; in the Armoury room 150,000 stand of small arms are in view at one time; they are piled up wonderfully neat and well kept. There are many very curious devices on the wall, made by putting up the pistols. Some very curious paintings and statues in this room. In another room you see all the different kinds of warlike weapons made use of for many hundred years back; also all things used for defence – coats of mail, &c, with all the trophies of war taken from every nation we have ever been at war with, many instruments for torture being among them. These latter are chiefly from Spain. In another department all the harness belonging to the artillery, with a great many different kinds of cannon, mortars, &c. In another room, ground floor, are all the Kings of England and Scotland that have reigned for 1000 years past; they are of nearly full-size, riding upon horses fully caparisoned in the robes of furniture, armour, &c., used in the time they lived. They have various appearances; they are all in a line, and front one way. The wild beasts are also well worth seeing; I have seen most of the animals that are there, but never ones so large. The fowls are very grand; but a person begins to weary before you get through them all. The Tower costs five shillings to see it properly. Sunday, came to London by seven o’clock, 22 miles. On coming to St James’ Park, the nobility and gentry were walking in the park by thousands, the evening being warm. The coaches were so many in waiting that they were a very wonderful sight to me when they began to coach as I was going past. I looked back, and all was in motion and driving quick step indeed. Put up at George and Blue Boar, Holborn. April 19th – Attended Smithfield back and forward from five in the morning till four in the afternoon. It was that day a very overlaid market, 2000 cattle, and 8000 sheep and lambs. As this was a matter in which as a grazier I felt myself much interested, 1 paid very strict attention. So far as I could judge, small Galloway, very fat bullocks, sold at 10s to 11s, after our Scotch stone, Dutch weight; shorthorn heavy oxen, 9s 6d to 10s; Lancashire, ditto; Devonshire cattle, 11s to 12s; they mostly stand tied to strong railings made on purpose. The heavy cattle stand in droves; they cannot move much, the holders-up have prods in the end of a stick to goad their legs with to keep them on foot; after 100 miles, or perhaps double, were they to allow them to stand still a minute or two they would lie down, and could not easily rise again. So soon as the cattle are sold, the holder -up takes out his knife, cuts off all the hair, of which he makes money by selling it to the upholsterers. Being acquainted with the value and weight, I now and then risked my opinion as to weight and price; told the salesman I was a farmer; they saw this, and gave me every information I wished. I offered to treat them with a glass of wine or so, which they all declined; no drinking there, either buying or selling. The butchers that came to purchase are very civil also. The business is done at one word or two at most, or no bargain; very unlike our Scotch butchers in every respect. Both salesmen and butchers all wore light-blue aprons, which meet behind the back. Every kind of cattle have their own corner in the market place; different kinds of sheep have their own corner or place also; calves stand tied to stakes by themselves. The Market Place, I think, may be about two acres or thereabouts. When the market is full two clerks take up the list or number, which the salesman gives; as also when the market is over merely the average prices both of beef and mutton. I saw the market on Friday also, which was by far a better market; no persons sell their own cattle or sheep; it is all done by salesmen, who are either paid so much a head or so much a cwt. Many of the cattle are bought by carcase. Butchers who onIy kill and dress them sell the carcase or a side to cutters-out that retail out in small pieces, so small as half a pound. Leadenhall market is a very great wonder, to see the quality, how clean and neat it: is cut up in joints and pieces of every description. A great quantity of leather of every description sold here, as also fish and fowls. To see the manner in which they cut out the meat would be well worth the expense and trouble of any young man in this country that intends following the butcher line. Fleet Market is another great butcher bank, and for many other articles. In this, as well as the last, after the steak is taken from the bones, they sell the bones in quantity to them who make soups, and marrow is also sold by the weight and at a very high price. Billingsgate is the greatest fish market, though there are many other places of less note. Meat and fish are to be had to buy in shops in every corner of the streets about in London. The King, hearing what Mr Frost said, came forward, asked me where I was from, what county, how much I farmed, and whether stock or crop, who was my landlord, what rent the Duke’s lands let at by the acre, what I thought of the agriculture there by my own country, what I thought of their method of draining, &c, with many other things, to all of which I could give him answers with the greatest ease, there being only two servants with him. He appeared as plain as any country gentleman, or even a farmer. He speaks good broad English, and distinct, yet from repeating so fast one is apt to lose him in part. On his farms in Windsor Park, which consists of 2700 acres, his stock is 600 deer, 140 oxen, 600 sheep, and a large dairy of cows. I brought Mr Frost home with me to dine, and made him very well for one night. At everything wonderful or great his prayer is “O Lord!” He says that, I daresay, 500 times a day. I was in the stable, byre, dairy, and all the outhouses. As my son Frank lived very near to Windsor for nine years, I found many of his acquaintances very happy to see me. I felt much at home. On Friday afternoon Mr Gurley went out with me all over the town, and saw the above things. We were in every room in Windsor Castle or Palace, the Chapel Royal, on the top of the tower, where we can see part of sixteen counties. The paintings are so numerous and so fine that they perfectly confuse the mind to go from one to an other. The furniture in the state room is superb, the view of the terrace is very beautiful; the castle stands high, and has a most commanding prospect. Every Sunday evening the Royal family walk round the terrace (if dry), just to please the populace. They live in a house called the Lodge, on the opposite side of the street from the palace, about 300 yards – a very plain-looking, small house. Frogmore House and Gardens stands in the Park, about half a mile from the Lodge, as sweet a place as can be, but rather a low situation; the river Thames runs past the castle about ten chains distant; they look down on Eton College on the other side of the river, and upon the whole Windsor is a most enchanting place. The trees in the Park stand at a great distance from each other, yet have the appearance of a close wood. I stayed all night to see the King and family go to chapel on Sunday. The sight was very grand; a fine morning. A regiment of Guards lined the one side of the Chapel or Palace Court, and the Prince of Wales’ Dragoons, on fact, lined the other side, with two bands of music playing some anthems at the chapel door. The King and Queen made their appearance first, the Duke of Cambridge and one sister next, the Duke of Kent and another sister, General Harcourt and another Princess, after that Lord Somerville and General Guidor followed. They walk very slowly up, and seemed very devout. The spectators got very near the walk, which is railed in, where we could see the very features of their faces as they passed. After passing the music they played “God save the King,” and the troops all filed off to the barracks; when in the gallery, a screen is drawn before them to prevent people gazing. I got in at an end door, saw the company, heard the singing boys and the organ a little. When they gave over I came to my quarters very much gratified; dined, and came to London that night. Had the King spoken to me going to chapel, I am positive I could not have answered any one thing – it was so solemnly grand. Friday, from Nettlebed to an inn, called Marlborough Arms, 9 miles. This is a very small village. Farming here not amiss. Lambs fit for weaning all the way, but don’t appear very fat. There I overtook fifteen very fine fat bullocks on their way to Smithfield. One of the drovers was a very civil, intelligent lad. I gave him a pint of beer, for which he seemed thankful, and gave me much information about their method of feeding; he had been feeder of these cattle all winter. I found they had left fifteen pounds each for winter feeding, but by a strict calculation they had cost for forage, turnips, hay, oilcake, &c, thirteen pounds, besides attendance: indeed they met with a very bad market. I saw them sold at Smithfield, the Devonshire “wubs” for the fattest. Two tip runts were the largest I saw in all my travels. From Marlborough Arms to Windsor, 12 miles. The soil here in general is very good, but there being two townships on the way, and all the ground cropped very differently, gave it a very bad appearance. The fences were as bad as ever. There are no rivulets or running water save the Thames. They lead water from it for several miles in dry times, as they have no access by driving. As we came near to Windsor the ground seems to belong to very many different proprietors, like other towns, yet even there, though within two miles of the Royal residence, the hedges are shameful to be seen; some were very well, but they were few in number. I am now at Windsor before dinner, a pretty, neat town – with some very elegant inns. Here there is a perfect retinue of company at all times, whenever the Royal family stay at Windsor Lodge. When at Bradley Hall I had told Earl Chesterfield of my intention of going to London, and desire of seeing the King. He told me the King was at Windsor, and that he would give me a letter to Mr Frost, the King’s factor, that would be of service to me, and put me in the way of His Majesty. This I accepted, which answered my purpose exactly. After dining at the inn (Mr Gourley’s), the Star and Garter, who is a very great acquaintance of my son’s, I sent out Lord Chesterfield’s letter to Mr Frost, with a card of my own, wishing to know when, where, and how I could see him tomorrow. On Saturday I got a very genteel card from him saying he would wait upon me at eight o’clock in the morning and carry me out to see everything I wished. This was done, and we rode over a great part of the park, particularly the north of it, called the Flemish Farm, of which Mr Frost has the management. I saw all the stock and labouring, which is very extensive. Most of the soil was wet. A great deal of very large old timber; some oaks eight feet diameter, but very short bodies. All the work done by oxen. Not a single horse on both this farm and another. I did not see Dryland, called the Norfolk Farm, and managed according to the Norfolk system. After riding to about 12, a servant of the King came to Mr Frost telling him to repair to the Great Ox Byre, where we had been, to show Lord Sommerville, General Harcourt, and General Guidor the principal fat oxen. The King wanted the opinion of their weight, value, &c. We accordingly went back, and waited a little before they came. They all alighted and went into the byre, and stayed a long while. I waited before the door where the servants were standing with the horses. At last they all came out, when I heard Mr Frost say to Lord Sommerville, “here was a farmer come all the way from Scotland to see the King and improvements of the country.” Upon this, Lord Sommerville came to me and asked me my name, where I came from, &c., when he recollected me, as I had seen him at Commissioner Brown’s, but had heard, or rather read of me, in the statistical account of Bowden parish. Thursday morning, to Woodstock, 10 miles; for 6 miles it is a high-lying country hill and dale, as was a great part of last stage, but very fine land, most of it a fine turnip soil, and very well farmed at this date. Saw 200 sheep clipped in the neatest manner that can be conceived; the sides of the sheep done off in four different directions, the marks of the scissors are like hurdles or palings. Lambs in general 5 and 6 Ibs. and compass. The side of the sheep had the resemblance of a bed quilt patchwork. They certainly excel the Scotch very much in this operation. Woodstock is a neat, clean place; a tavern twice as large as that at Kelso, and some very spacious inns. The town joins close to the side of the park of that name. The park is enclosed with a wall twelve feet high and thirteen miles round. A gate or entrance to the house is at the end of the principal street. Upon opening the gate you have at once a full view of Blenheim House and policy. The water pond, which consists of 30 acres of water, surface all artificial, and the banks dressed off in the neatest manner and to the best advantage. Boats moored here and there on the lake give it the appearance of a salt-water harbour. The house of itself is certainly the most princely thing in Britain; the carving on stone, the painting, and the representation of all the trophies of war taken by his Grace the Great Duke of Marlborough, the fine taste displayed by the architect in planning as well as executing the work. The garden, the wood in the park, and the regular plan in which it has been laid out and planted; the monument erected in memory of his Grace, 120 feet high, about a mile from and fronting the house; with many other things beyond the limits of my paper, makes it the most magnificent and stately of all I have ever seen. The expense of the whole was done by Government during Queen Anne’s reign; and the sum must have been immense. A book to be had at the house, price 1s, describes the whole; and persons decently dressed may have admittance to see everything out and in for paying about 4s to the servants in the different departments. From Woodstock to Oxford, 8 miles. Large tracts of common ground this stage; fine soil; the nature of the soil very variable; some very good, other parts very poor. Beans and barley seem to be the staple grains mostly sown from Carlisle to this part all the way. I am fully convinced that all the oats they raise will not serve the horses, and the inhabitants must depend on importation or the other grain. There is very little oatmeal used anywhere here, or by any class of men. Oxford is a large town, and from the extent and number of ancient buildings, it has certainly been the second, if not the first town in England. To describe it properly is beyond both my abilities and limits. I spent a good many hours and shillings to see as much as my time would permit. I bought a late publication which describes the whole very justly, from which I have taken the following notes, whereby every reader may have some idea of the place. There are twenty different colleges, all large buildings and under different rules. In some the collegians are lodged as well as educated. There are five public halls, and fifteen large churches. The situation is low, but pleasant. The number of collegians here must be great. I could not learn how many. I think it a wonderful place. The carving on some of the buildings is very grand, and some of the statues very well done. Farming here better than most places I have been at. Fences pretty well kept. From Oxford to Benson, 12 miles. A great many turnpikes raised this stage. Very good farming here. They were still feeding sheep on hurdles, giving them a little hay with their turnips, and in some places a few potatoes. They are also eating wheat with sheep, and confining them on corners by hurdles and palings. Lambs in general 5 and 6 lbs the leg, Dutch weight. Benson stands upon Thames forty miles west of London. Small craft come up all the way. In point of situation nothing can be more pleasant; before entering the town, for one mile the road is an avenue with trees on each side, 150 feet broad. The town street is wide; three capital inns, besides small ones. It seems about twice as large as Hawick. From Henley to Nettle Bed, 6 miles. The house a small cottage. On crossing the river at Henley Bridge we ascend a pretty steep hill for several hundred yards; when at the summit and looking down upon Henley, the prospect is beautiful; from thence you see up the river for forty miles, and down all the way to London. The banks all green fields. From this you see a part of a great many counties. The land all manured, with chalk quarries in it 50 or 60 feet deep, and in some places the road cut through little hills of it. When rainy the road is as slippery as if on soap; and what is worse, the road surface has exactly the appearance of what is thrown out of soap works. Wednesday morning, from Hawkley to Stratford, 12 miles. This stage in general very plain, and the soil thin and poor; a great many beans planted in drills. They are well up, like cabbage plants. I found they had been planted in January or February. The enclosing or shape of enclosures here resembles the face of the country betwixt Maxton and Melrose, only no hills like the Eildons; the ridges are all of the broad crooked or curving shape. The hedges here are better, and very little ivy to be seen. The river passing here runs westward. A great deal of marsh or old hay ground on the hanks of it resembles the Meadows at Edinburgh. Small crafts go upon it, drawn by horses. Several cotton mills go by water. I have also seen corn mills going by water this stage. Stratford is a very neat clean place, not very large; few post chaises used here, all flys and diligences and opposition coaches; few to be seen on horseback. The horses used for labour are all of the heavy kind, in general with very rough legs. 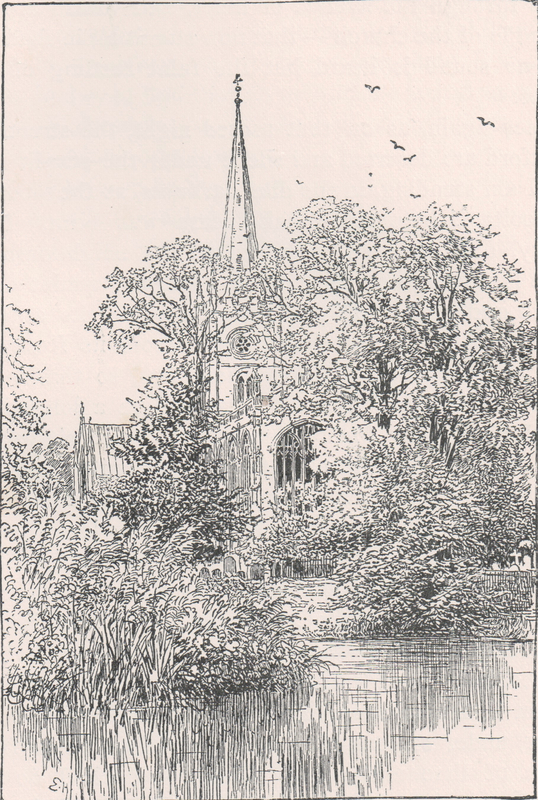 From Stratford to Shipton, [Shipston-on-Stour] 11 miles. The roads on this stage in general are very broad, perhaps 200 feet. A piece of grass ground left on both sides of it. Here bands of gipsies live in tents, and their horses and asses feed by the road-side. The gentlemen are not very fond of meddling with them. They behave themselves very well, and never pilfer near where they sojourn for the time. You may see the places where they have pitched tents; they have cakes and earthenware to sell, as our banditti have. Here the hedges begin to be as bad as ever, and the ugly-looking trees all pollarded. From Shipton to Chapel House, 10 miles. This is a very large inn, stands upon a high situation. They can put up a troop of dragoons on their march. I numbered the windows in the front of the house, being 57. How many there may be besides I cannot say; we may suppose 30 more. It’s as civil a house as any in Britain; the landlord a very intelligent young man, who understands farming well. On this stage there are a great many small township lands, where they have a third of the corn grounds in grass banks. They say they do so for pasture for their cows, and a part they cut for hay. Here they study no conformity in their mode of labouring or laying out the fields. On the top of a high ground the road goes over about a quarter of a mile to the left; there stands a stone about 10 or 12 feet high. It is somewhat the nature of a mill-stone; it is defaced by time, but it has still a good deal of resemblance to human shape; and about 300 yards from it there are about 30 stones of the same nature, all standing on an end. The people here say this was a king, who with part of his army that had escaped slaughter were flying, but by some magical power of his followers were enchanted, and there they stand. I rode round about them and got the description from a man who was cutting hedges close by. This account they firmly believe, and they seem to pity the poor stone king.